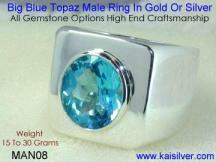 We Are The World's Largest Provider Of Online Custom Made Jewelry. Our Factory Direct Contacts With All Leading Gemstone And Jewelry Producers In Thailand Give Us Access To A Massive Inventory Of Over 100 Million Carats Of Gemstones, And A Gigantic Base Of Skilled Craftsmen. Our Clients, Most Of Whom Are Repeat Buyers Include Fashion Models From U.S And France, Also Members Of The Armed Forces In Both The U.S And The U.K, Resort And Hotel Owners, Racing Car Drivers Etc. We Provide Total Customization For All Your Jewelry And Gemstone Needs. Pricing And Other Details For This Custom Made Man Ring In Sterling Silver Or Gold Are Available. Click Here For Pricing And Other Details Of This Custom Mans Ring. Few Man Rings Would Have This Quality Of Craftsmanship And Detail In The Design. 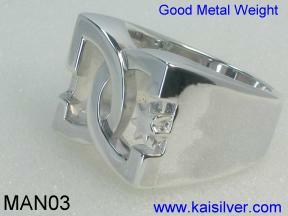 This Custom Man Ring Can Be Made In White Or Yellow Gold Or Sterling Silver. You May Also Decide To Add A Gemstone Or Diamond In The Star Sign On The Ring. 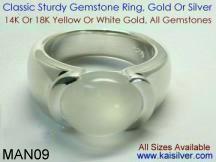 Tell Us What Gemstone You Prefer And We Will Quote You A Price For The Ring. The Standard Version Of These Man Rings Do Not Have A Gemstone Or Diamond Included. If You Need Any Other Changes To These Man Rings Or Need Something Totally Different Do Not Hesitate To Email Us At sales@kaisilver.com Provide Us The Details And Images If Possible And We Will Be Glad To Work With You On The Final Specifications And Price Quote. Understand What Makes These Custom Man Rings A True Winner. 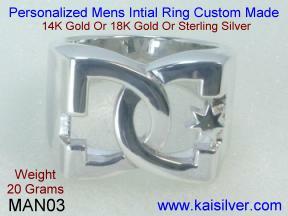 Click Here For More Details On The Making Of This Custom Ring For Men. The Shipping Charges For Shipping Worldwide Is 25 U.S$ By EMS Or FEDEX. You Can Combine Shipping Charges For Other Merchandise From Our Website And Auctions. Shipping Will Be Within 3 To 4 Weeks Of Order Confirmation And Receipt Of Payment. Payment Can Be Made Through Paypal Or By Money Order In U.S$. We Will Ship After Getting Payment Clearance From The Bank. We Are Verified International Premier Account Holders Of Paypal. 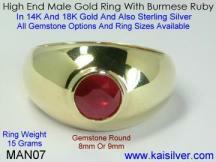 Our E-mail Address For Paypal Is info@kaisilver.com Click For More Details About Paypal Payments. 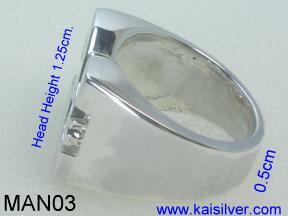 Kaisilver was the first to prove that men's rings need not be dull and boring. Our designers have created a whole range of high end rings for men. Good gold weight, hand picked gemstones custom cut to perfection and high end craftsmanship, are common to all our jewelry. You can select the gemstones of your choice and choose from 14k and 18k yellow or white gold. We also custom make jewelry as per your designs and images.